Pennite® 982 is semi conductive PPO sheet designed for thermoforming ESD applications that require very fast discharging. 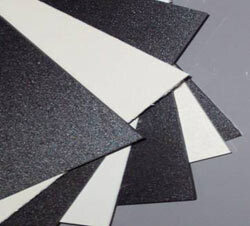 Product is highly filled with conductive carbon black and is thus black in color. Pennite® 982 gives suppliers of thermoformed components such as trays and bins in electronic applications a solution for a highly conductive material with great electro static dissipative properties. Properties below measured on .080 inch thick sheet.